It’s that time of year again when we get super confused, stressed and frustrated with figuring out how to file our taxes. In addition to the normal tax stresses, the U.S Government changed the tax code in 2017 which will most definitely affect your 2018 tax return. According to Nerd Wallet, “taxpayers still don’t understand the new law: 28% of Americans are unsure of what exactly changed with the passage of the Tax Cuts and Jobs Act of 2017, and 48% don’t understand how it affects their tax bracket.” So this is what you’re going get from reading this post: 1) my favorite online tax software companies, ranked by Simplest to Use, Best Value and Most Affordable and 2) explain how the tax brackets have changed due to the newly enacted tax law. Now let's get started. There is a reason why many of us turn to TurboTax when it comes to filing our taxes online. TurboTax has a simple, user-friendly platform that guides you along the filing process and provides you with live support called “TurboTax Live” (which is an additional fee), where a CPA or qualified tax specialist will review your tax filing and give you unlimited live advice. Once you and your tax specialist are finished reviewing your tax return, TurboTax will e-sign and submit your tax return on your behalf. The only downside to TurboTax is it's more expensive than its competitor’s. You can easily spend over $100 filing your taxes through there platform. So with TurboTax, the tradeoff is this: pay a little more, but gain the confidence that you are maximizing your tax refund. This year H&R Block will give TurboTax a run for its money, as they have an easy interface with some of the best support on the market. H&R Block has introduced “Ask a Tax Pro” (which is an additional fee) and competes directly with TurboTax Live. With "Ask a Tax Pro," you will be able to share your screen with a tax pro on your mobile or tablet during normal business hours, and receive unlimited chat sessions with a tax expert. H&R Block also has a service called “Tax Pro Review", which is a one-on-one review with a CPA or qualified tax specialist, who will review your documents and check for missed deductions or credits. Just like TurboTax after the CPA has completed their review, they will e-sign and submit your tax return on your behalf. Finally, if you rather file your taxes in person, H&R Block has over 12,000 brick-and-motor locations across the U.S. So if you're really struggling or just want a pro to file your taxes for you, then stop by one of their stores. Of course, there is an in-office fee starting at $59, but at least you have this option. If you are familiar with TaxAct, then you may notice this year they have revamped their software making it easier for you to file your taxes online. TaxAct is the most affordable of the three tax software's discussed in this post, but you will not receive the same online support. You will receive free e-mail support as well as unlimited phone support if you purchase one of their higher end packages. I would recommend TaxAct if you are someone who understands how to file their own taxes and only need a little support from the experts. It is important to understand all three tax software products described in this post will allow you to file both your Federal and State Tax Returns for free. I only recommend doing this to those who have one stream of income, no investments in either the stock and or real estate markets and no student loans. If you have student loans, you will not be able to deduct the interest on any one of the "free" editions and will need to pay for an upgraded package. Even if you only have one stream of income and no other investments or deductions, I would still recommend paying for at least a basic package, so you have support should you need it. The chart to the right which I pulled from Investor Business Daily, sums up how your tax rate has changed from 2017 to 2018. It is important to understand how to calculate your taxes, so here is a quick example. If you earn $50,000 a year, you are taxed at 10% on the first $9,525 of your earnings, then 12% on income earned between $9,526 - $38,700 and finally 22% on income between $38,701 - $50,000. 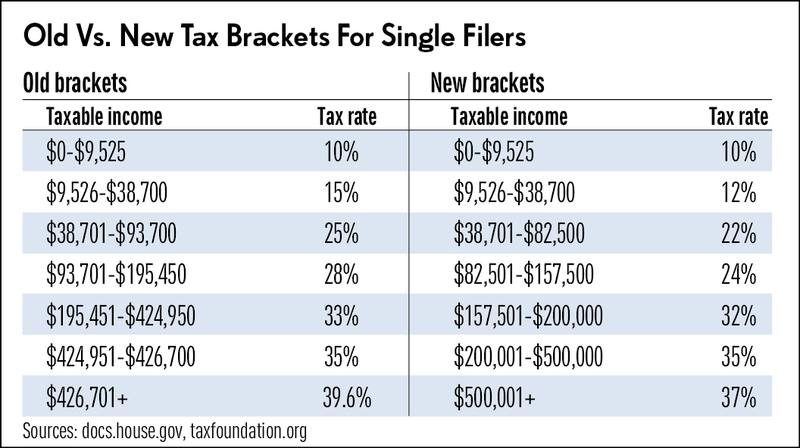 These tax rates are only applicable to your Federal Income Taxes, and sadly do not include your State and Local taxes. So here it is: Use TurboTax if you want to complete your taxes using one of the best platforms on the market and don't mind paying a little extra for it. But don't forget about H&R Block which has a pretty close platform regarding simplicity but superior customer support in my opinion. And finally, if you already know what you're doing but may have a question or two, then take a look at TaxAct, where you won't have to drop $100 plus to file your taxes. Note: Prices of specific tax providers and services change from time to time, so for the latest pricing, please be sure to click on my links for the latest prices.